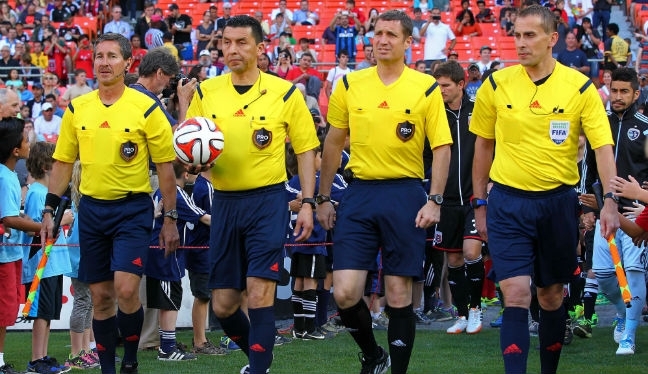 Image: Mark Kadlecik (center right), walking onto the field alongside his PRO officiating colleagues. Every official on the Professional Referee Organization’s roster is unique – unique in background, personality, appearance and, of course, refereeing style. Their personal stories that explain their respective journeys to the top of North American officiating are also unique. In Mark Kadlecik’s case, his refereeing career started with a card; a yellow card. “As a player I got my only yellow card as a 12-year-old,” he told proreferees.com. “It was a little championship game in New Jersey and I was giving the referee some stick. “He gave me a yellow card for dissent and, after the game, he told me that he didn’t agree with what I was saying but there was some merit to it. “He told me to consider taking a refereeing course, so I did. I then took refereeing further when I went to college. They had a lot of collegiate games there so I went down that route. Kadlecik’s professional refereeing debut came in 2011 in a MLS game between Toronto FC and D.C. United, but he has since fallen from the Major League Soccer middle in what he describes as one of the most frustrating times of his life. He is now listed as a fourth official and regularly referees in the NASL, combining that with his job as an Athletic Director at Durham School of Arts in Durham, NC. That’s not to say he’s not doing his utmost to get back to the MLS middle. “I worked so hard to get between the lines in MLS, got there, and then got complacent. I thought I had made it. “I realize I still have work to do so I use every opportunity to improve my craft every time I take to the field. Regardless of what game I am assigned to, I strive for perfection with my decisions and positioning – two key components of top-level officials. “Of course, no one has ever officiated the perfect game but it is what I strive for. “My wife Krista, whom I recently married in November, has been great as well. She gives me tough love but is always there to listen. When I am down, her ‘head-checks’ make me realize how fortunate I am to be in the position I am in professional soccer. As well as his wife, the North Carolina-based official can also lean on the support staff of the Professional Referee Organization. And that has been key for him this year, receiving advice from Brian Hall – a former FIFA referee and now PRO’s Match Official Development Manager – amongst others. Kadlecik says perseverance has been key since his fall from MLS – and that’s the advice he’d pass on to others – but he feels he is now seeing improvements in his performances. “Brian and I had a great discussion going into the season. His advice was to approach this season like it was 2011 when I worked 15 MLS games as a referee when I was a rookie. His advice was so simple but it has clicked for me. “I have blocked external negative factors which have hindered some performances in the past and gone in with the mindset I had in 2011 which was, ‘I am going to have a good game’. “The fitness program we have with PRO is very beneficial, too, and the classroom sessions we take part in are also vital. “On the road back to MLS, confidence has been a stumbling block for me but confidence from the touchline has been a strength of mine this year. “And it has been noted on my mid-season report that confidence is leading to better performances, which is good.